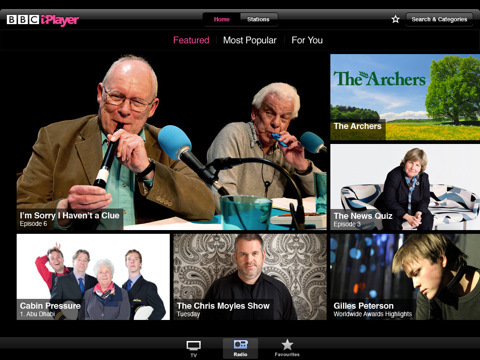 BBC iPlayer for iPad is here, right now in the UK App Store for free. Watch BBC TV and listen live, or choose your favorites from over 400 hours programming from the last 7 days. The HD video quality is really amazing and you get both live and archived shows on demand with a very fast and beautiful user interface that you’re probably already used to seeing. Unfortunately the BBC iPlayer is not out in the US App Store, so you’re probably going to want to get the ABC Player for iPad instead. You need to be on WiFi to play shows, but you can browse shows over 3G. It would be nice if you could download the shows to watch later offline. There is no iPhone version of the BBC iPlayer app. Although there is an Android version of BBC iPlayer, which uses the Flash player functionality. Notes: The news about the long awaited iPlayer app was first leaked out via Twitter by Geoff and has since been confirmed on the BBC Blog. Some backlash has been coming out due to the lack of an iPhone app. AppSafari review of BBC iPlayer was written by Joe Seifi on February 9th, 2011 and categorized under App Store, iPad apps, News, TV, UK, Video. Page viewed 4627 times, 1 so far today. Need help on using these apps? Please read the Help Page.